278 people left New York. Five survived. Everyone has heard of the Titanic, but few people can name the ship that was associated with the worst nautical tragedy in American history before that point. Indeed, few have heard of the wreck of the Evening Star, yet this shipwreck (which predated Titanic by almost 50 years) was considered the greatest maritime disaster of its time, and Fernandina Beach is a prominent part of its story. The Evening Star was a passenger steamer, and it left New York bound for New Orleans in late September, 1866. There were 278 people on board; 14 of those were crew, and one was the captain. The Evening Star was sent to sea with no spare sails or spars, and lacked a ship’s carpenter to make repairs as needed in case of a disaster. The ship carried six lifeboats, each with room for about 10 people -- enough to save less than a quarter of those on board in the event of an emergency. Girard looked on with disgust as the sailors rifled through the pockets of anyone who succumbed to starvation, thirst, or exposure. The ship ran into a hurricane 180 miles off the coast of Tybee Island, Georgia, on October 2nd. During the early morning hours of October 3rd, the ship began taking on water. Attempts were made to bail water out of the engine room, but these were to no avail. At around 5:00 am, Captain William Knapp made an announcement to the passengers that the ship would surely sink. During the commotion caused by the storm, only four of the ship’s lifeboats made it into the water. All were capsized several times, and subsequently bailed out by the people inside them. This sad cycle continued for hours until one boat was cleared out completely, and all aboard were lost. Two of the boats drifted for two days, and were later rescued by a passing ship and taken to Savannah. The last boat began a harrowing five-day journey that brought them to the shores of Fernandina Beach, Florida. Most of the men on this boat were crew members. The only Evening Star passenger on board was an actor and former Union soldier from Brooklyn, New York, named Frank Girard. He left a detailed account of his experiences, via a letter written to a friend back in New York. From this document we get a passenger's perspective on the incident. In the devastating final moments before the ship went down, Girard suffered a broken nose and got a large laceration on his leg. After clinging to a wooden trunk to keep himself afloat, Girard spotted a lifeboat with five crewmen and five passengers inside and attempted to pull himself in. One of the sailors attempted to hit him with an oar to knock him out of the boat, but Girard was able to fight the man off and stay inside. 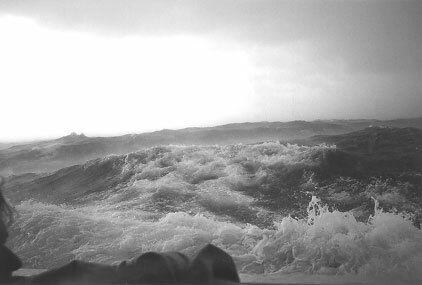 He wrote about his shock and dismay over the actions of the sailors in his lifeboat. Other passengers, who had by that point survived by clinging to broken pieces of the ship, tried to enter the boat, only to be rebuffed by the sailors. As one young man tried to climb into the boat, his hand was slit by one of the sailors. Another crewman threatened to “brain” Girard with a piece of wood as he moved to help an older woman into the boat. Girard looked on with disgust as the sailors rifled through the pockets of anyone who succumbed to starvation, thirst, or exposure. After they died, the sailors would steal their clothes and throw the bodies overboard. Some of the passengers became so thirsty they began to drink salt water, which led to their deaths. Girard followed the example of the crewmen, who survived by drinking their own urine. The Atlantic Ocean during a storm. boat and was eaten raw after being fought over fiercely, the men had no food whatsoever. Girard had no means of treating his leg wound, and it began to grow numb. On the morning of the 5th day, the lifeboat finally found itself in sight of land. The small boat had traveled almost 150 miles, all the way to Amelia Island, Florida. At this point five men were left; Girard and four sailors. They came ashore somewhere near Fort Clinch, and dragged themselves out of the boat. Girard was unable to stand due to his leg wound and asked for assistance from the sailors. They ignored him and left him lying on the beach. Girard began to drag himself across the ground hoping to come across someone who could assist him. After crawling for about a mile and a half, he came across a puddle of rain water, and was able to drink water for the first time in five days. Meanwhile, the sailors had come to the door of a cabin only to be refused entry until they could produce the injured man. The sailors backtracked, hoping to find Girard so they could use him as a means of proving they were truly in need of help. They came upon him about a mile from the cabin, and now they eagerly helped him to his feet and carried him the rest of the way. The board determined that the ship had been sent from port with an insufficient amount of crew, and badly in need of repair. With Girard in tow, the sailors made it back to the cabin, where the old gentleman and his wife welcomed the party in and sent for a doctor. The doctor informed Girard that his leg would have to be amputated. Girard objected wholeheartedly, and fortunately he found a supporter in Fernandina’s mayor, Sammuel T. Riddel (the owner of the cabin sent for not only a doctor, but also the town mayor). Girard was taken to Riddel’s home where he spent the next three weeks recuperating. New doctors were brought in to treat Girard’s leg wound. They diagnosed a contusion, and said the bone had to be scraped clean. Girard refused to take chloroform to numb the pain, because he feared they might be planning to amputate his leg while he was unconscious. After recovering from his wounds, Girard returned to New York by train, and so ended the long and arduous journey that took him all the way from Brooklyn to Amelia Island. Of the nearly 300 souls that departed New York on the Evening Star, there were only 17 survivors. The United States government created a board of inquiry to investigate the incident. The board determined that the ship had been sent from port with an insufficient amount of crew, and badly in need of repair. She was in no shape to withstand the dangers presented by hurricane season in the Atlantic. It was also stated during the inquiry that if the ship had a competent carpenter on board who could repair damage as it occurred – like mending the ship’s disabled rudder – the sinking might have been avoided. A few of the ship’s crew, survivors from the other boats (the two that made it to Savannah) wrote their own accounts of the tragedy, which can be found online. Frank Girard passed away in 1900, at the age of 60. He was 26 when he boarded the Evening Star on its ill-fated last voyage. His first-hand account of the entire ordeal, including his time in Fernandina, can be found in the Archives of the Amelia Island Museum of History. Gray Edenfield is Education Director for the Amelia Island Museum of History. His blogs are reposted here by permission.